/ Band Lighting Gear – What Do I Need? When you’re first beginning with band lighting, it’s really difficult to know what you should buy to make a great show. “Company A” has these lights that they’re promoting to bands, while “Company B” has other lights. Meanwhile, you see something out of the corner of your eye in the music store that looks cool too. Navigating the world of spec sheets and comparing different lights and consoles can be a total nightmare! I want to show you how to make a show that rocks without spending a huge budget. The first priority in any lighting system is the wash of front light. To accomplish this, we want to get some lights out in front of the band. Depending on the venue, this may be satisfied by lighting trees on the front corners of the stage, towers at FOH, or lights hung on a front truss or pipe provided by the venue. You want to have a white “special” for every band member as well as a colored wash over the whole stage at the minimum. LED fixtures that can mix many colors will play both roles for us nicely. Then, we can add more lighting to sweeten the show. At this point, you’ve got a complete rig that you can go and do shows with…almost. The best lights in the world are worthless if you don’t have a way to control them – if at this point you’re at a stopping point, scroll down to “The Console” to learn how to control your lights. After you’ve got the front covered, the next key to great concert lighting is to have backlight. Backlighting works with the energy of the music to create fabulous “beam” looks in the air with atmosphere and colored highlights around performers and equipment. By flashing through different colors of backlight and running chases, you can really amplify the mood being built by the band. Backlighting can also create intimate spreads of color when used with selective frontlight, while the beams frame the band on stage. You can fade out the backlight all the way for a real close, intimate look, or fade all the frontlight out for an epic, moody moment. When you’re lighting a band, most of your fixtures are probably going to end up on the backlight truss to create the dynamic effects you’re looking for. So far we’ve covered the basics – we’ve got some washes so we can see everybody. We’ve got them covered from the front and back, so now it’s time to have some real fun. Whether it be moving lights, strobes or more LED fixtures – effect lighting fixtures add fun to your lighting rig because they don’t have to be on in order to see the band. With the right control console in place, you can also use your front and back wash lights to create FX at times. You can use moving lights on and off in your show to create a greater dynamic range of light. Strobes and blinders can be used occasionally to pound the stage or audience with flashes of light, and blinders can be set up to backlight the band in a warm glow or provide temporary light in the house. Effects lighting can be in any position you want- whether that be an existing lighting truss, or something new such as the ground, side boom pipes or a new truss. But that really depends on the resources you have. Moving lights on the ground or blinders on your risers work great as a starting point! This wouldn’t be a concert lighting post without talking about haze! Haze is that awesome stuff that allows you to see the beams of light in the air, and it’s used at every concert, even outdoor shows. Learn more and find out my recommended hazers here! Different venues are going to have different policies on what types of atmospheric effects you can use, so consult them before using haze. This is especially relevant in newer venues, as they usually have optical smoke sensors which will go off with haze. Some venues may require you to set your fire alarms and silent and have a fire watch on site. Never, ever turn off fire protection equipment without first consulting your local fire marshall and having their blessing. It is highly dangerous and illegal to do so. After you’ve got all of your lights set up, it’s time to go back to the console and program like mad! For bands starting out with lighting, I recommend Enttec’s DMXIS, because it’s both easy to use and versatile. The biggest plus for a band is that DMXIS is designed to run on its own, either programmed to your backing tracks via a VST plugin or via the 1/4″ footswitch input on the controller box. You can get away with cheaper consoles, but I wouldn’t recommend it. DMXis is priced around $300 US, and I would rather you buy 1-2 less lights than a cheap console. The difference in impact that you’re able to make with the right console far outshines a few lights. Congrat’s – you’ve made it to the end of this article! 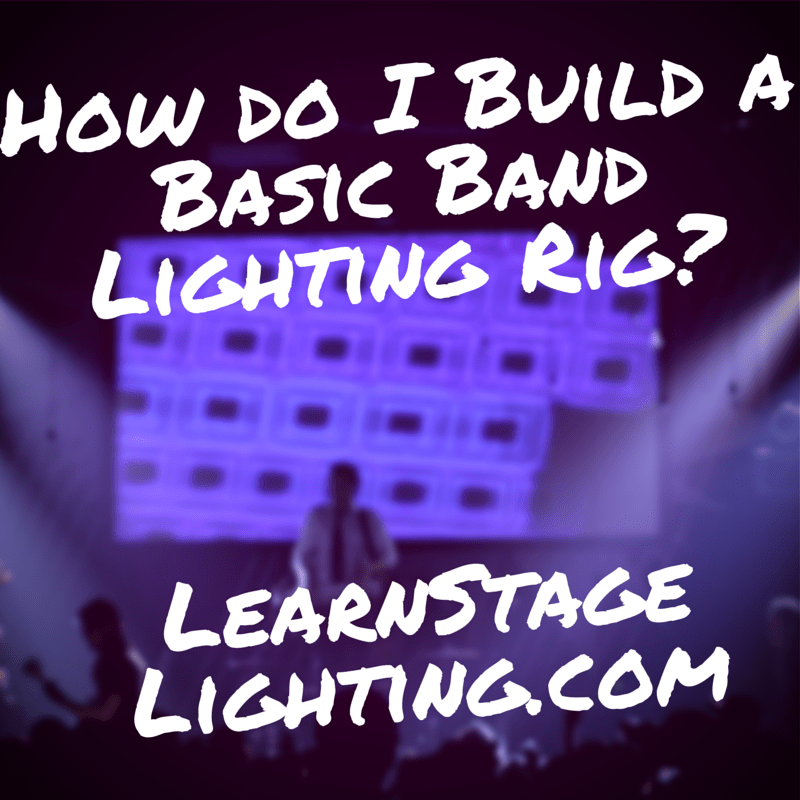 If you’re just beginning with band lighting, I’ve got a free guide to help you learn what gear to choose and how to set it up correctly. Click Here to Grab Our Free Training to Transform Your Lighting!